Postcard US-3202783 to USA features a traditional Chinese New Year of the Goat motif on the left panel and a photo of animated goats on a 14-foot or 4.3-meter tall grassy hilltop at Bellagio's Conservatory & Botanical Gardens on the right panel. From their vantage point, I-Ching coins are seen lining under the foot of the hill; live Koi swimming in a 21,000-gallon pond by the waterfall; children made of more than 1,000 fresh flowers each dancing amid bamboo trees and red lanterns. 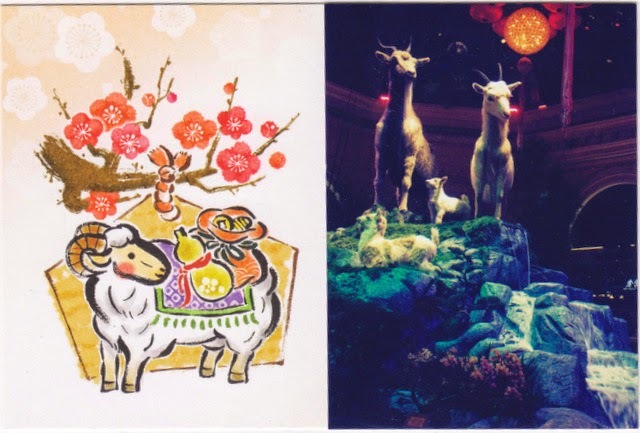 The Year of the Goat (or the Year of the Ram, or the Year of the Sheep) decorations are on display at Bellagio from January 9 to March 14, 2015 with daily live music performances between 4:30 p.m. and 6 p.m.